Our antibodies, reagents & recombinant proteins are now available in the VWR catalog. We’re making it even easier to save money. Order online at www.vwr.com or through your purchasing system (SciQuest, Ariba, etc). 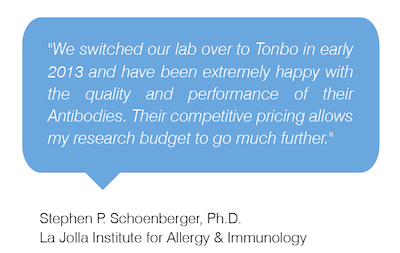 Visit www.vwr.com for a complete list of Tonbo Antibodies, Reagents & Recombinant Proteins.